So you have your characters and your plot. Your characters are are multi-faceted, they are clear to the reader. Your plot is well-planned and connects seamlessly. Both have been polished to a sparkle and a shine. But the two won’t fit together without a little help. The characters need a setting to join them with the plot. 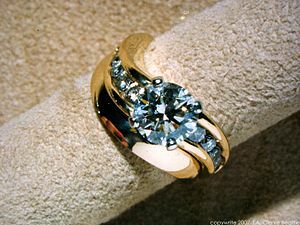 Just as with a diamond ring, setting joins the two elements into a whole. Setting is more than just a place to stand. Just as the setting affects the final appearance of the diamond, setting also affects character. Your setting may be flashy or unobtrusive but it helps define your character’s shape and limits. Your setting shows off your character. Your character shows off your setting. As with a ring, the setting in a book is often the weakest point. It is easy to skimp on materials when creating your setting but if you do this, your project may not hold up in the long-term. A solution is to take just as much care with your setting as you do with your characters and your plot. The readers of your book will thank you. Posted in Setting, The Process, Uncategorized.Tagged dragon plume, dragonplume, plot, Plot (narrative), plotting, setting, writer block, writing plot, writing setting.